This chicken is so good that Brendan took one bite (eyes closed, of course, which is his “tell” that something is seriously delicious) and said something so filthy it’s unprintable on this blog. The Greek yogurt and lemon marinade tenderizes the chicken over the course of a couple hours, and the mix of spices sinks all into it and combines to make some of the tastiest chicken I’ve ever had. This is a great make-ahead meal if you meal-prep, and it’ll keep for a full work week. I strongly recommend grilling this, as that just takes it to a whole other level. 1.5 lbs chicken breasts. I used thinly-sliced, but you could do regular size too. 1 6-oz (approx) container of plain greek yogurt – not fat-free. This is key. 2. In a dish large enough to hold all the chicken, combine the greek yogurt and lemon. Combine until mixed well, then fold in all the spices. 3. Add chicken to the spiced greek yogurt mixture, then coat evenly, making sure all chicken surfaces are covered. 4. Marinate for at least four hours and up to ten. 5. Grill the chicken until it’s done, flipping once or twice and getting those nice grill marks (thanks Bren). 6. When chicken is fully cooked, serve with a nice root vegetable salad or save for a week’s worth of meal-prep deliciousness. This entry was posted in chicken, dinner, make-ahead, meal prep and tagged chicken, meal prep, simple on May 26, 2018 by westyn. AKA, “a compromise.” It’s no secret how much I love pasta, but sometimes you’ve gotta find a middle ground. This replaces noodles with baked parmesan-dusted zucchini strips (which honestly, I would eat as a snack on their own, because they were fantastic), adds protein with some ground turkey, reheats amazingly well and will keep for a few days, too. It’s a perfect make-ahead meal which you can then just throw into the oven and have it ready in 30-40 minutes flat. AND i used a mandoline for the first time and didn’t slice off one or more of my fingers, so you know, win/win. 2. Wash the zucchini, then slice it into 1/4 inch flat strips (uniform size). Lay all the zucchini on paper towels, then sprinkle with kosher salt. Let sit for about 15 minutes, then flip and sprinkle the other side with kosher salt, let that sit for 15 minutes too. This will drain out a ton of water and you won’t end up with soggy zucchini lasagna. 3. Rinse the salt off the zucchini and dry really well. Coat with a tiny bit of olive oil. 4. Combine about 1/3 c. parmesan and the bread crumbs. Coat each slice of zucchini with the breadcrumb mixture, then place in one layer on (a couple of) baking sheets which you’ve sprayed with baking spray. 5. Bake zucchini for about 30 minutes, flipping once, until golden and fairly crispy. 6. While zucchini is cooking, dice the onion. Cook in 1 tbsp. EVOO until onion is translucent in a large pan over medium heat. Remove onion and set aside, then cook the turkey in the same pan until browned and cooked through. Remove and combine with the onion. 7. In a lasagna pan, dot a bit of sauce to make a thin bottom layer. Place one layer of zucchini on top of the sauce like you would place noodles, then add a layer of the turkey/onion. Sprinkle mozzarella & parm over the top of this. 8. Repeat this sequence: sauce, zucchini, turkey/onion, mozz/parm, until you’ve reached the end of the zucchini. Add a little more sauce and the rest of the mozz/parm. 9. Bake, covered, for about 15 minutes, then uncover and cook for another 15 or so, or until sauce is bubbling and cheese is melted and golden. 10. Let stand for 10 minutes, then cut and serve, preferably on a table with the gorgeous 2-for-$5 bunches of flowers you got at the farmer’s market. 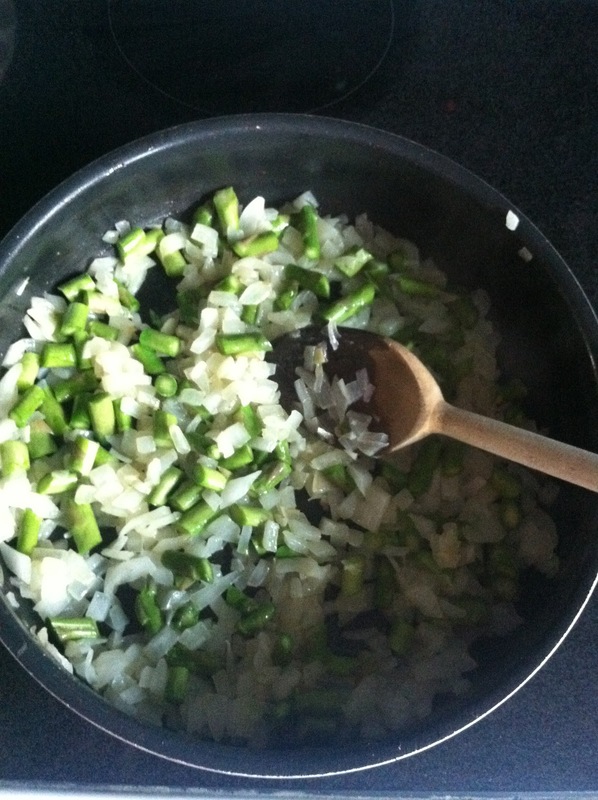 This entry was posted in healthier, lasagna, make-ahead, zucchini on September 3, 2014 by westyn. I’ve never been much of a breakfast person. I tend to subscribe to the ﻿whole “food doesn’t fit into a specific time slot” theory of eating, which basically means that if I’m craving pancakes, it’s usually for dinner, and whatever leftovers I have from the night before (especially pasta), it’s what’s for breakfast. That said, I am completely obsessed with breakfast burritos. Not only are the healthy, versatile, and filling, but you can make a whole batch of them and freeze them, then nuke them individually for maybe 2 minutes and your breakfast is ready to go. For those people who love sleep and consequently are pretty hurried in the morning (me), these are a great timesaver, and a much better option than the sodium breakfast sandwiches available at just about any of the places you can stop at on your ride in to work. 1. Dice up 1 vidalia onion and maybe 1/2 a bunch of asparagus. Asparagus spears will naturally break off at the part of the stem that gets woody if you just bend it until it snaps. 2. Melt 1 tablespoon butter and 1 tablespoon olive oil in a saucepan over medium-high heat. 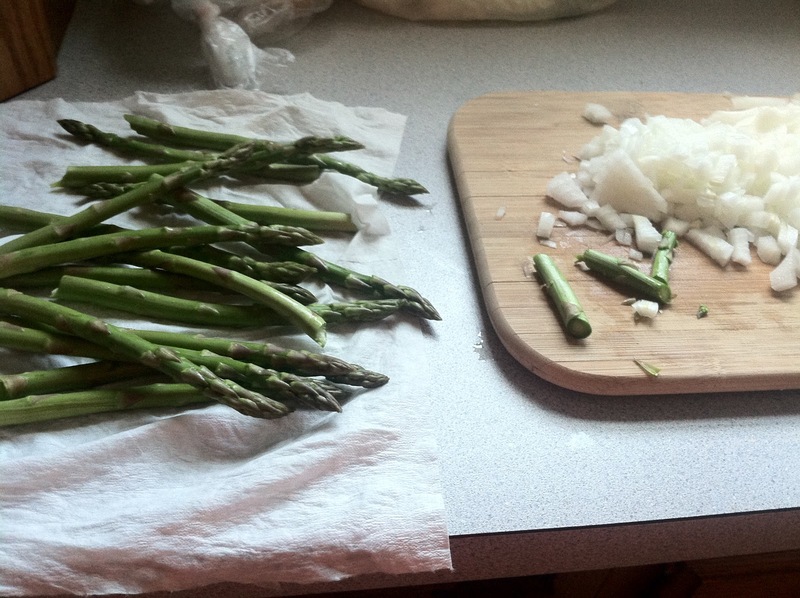 When melted, add the asparagus and the onion, cook until soft. 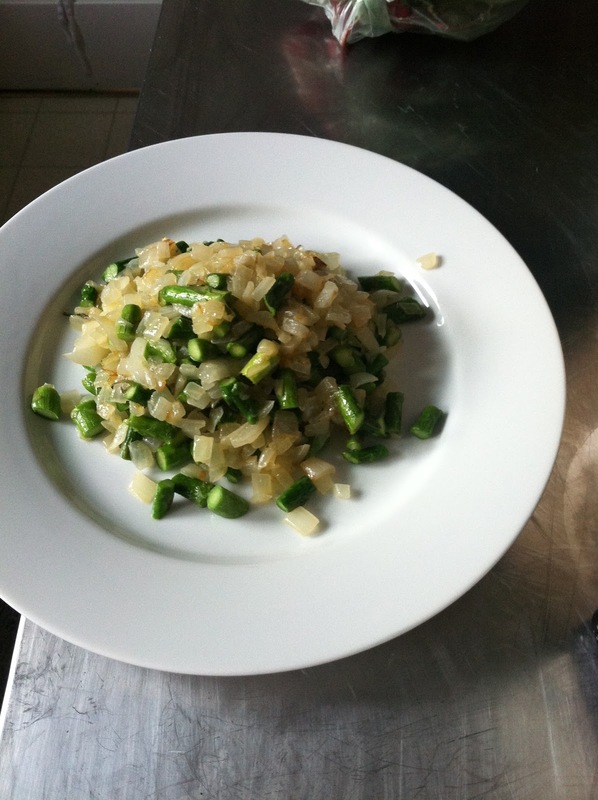 Remove from heat and transfer the asparagus/onion mixture to a plate. 3. 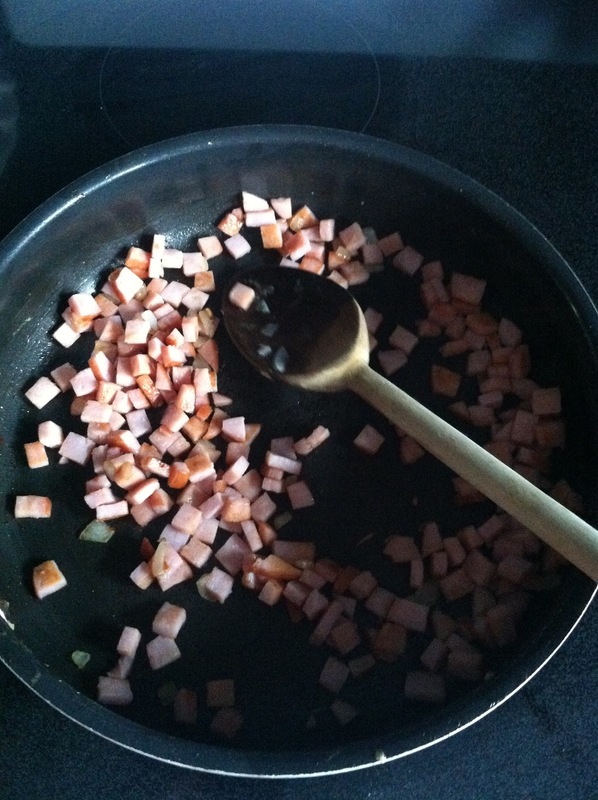 Dice some breakfast ham, and add to the pan that the onions and asparagus were in. Cook until browned, then remove from heat and transfer ham to the plate with the asparagus/onion mixture. 4. Using that same pan, melt a small tab of butter and add eggs that have been whisked. I used mainly egg whites, maybe 1-2 egg yolks. Yolks are chock full of cholesterol, sure, but they mainly just gross me out. 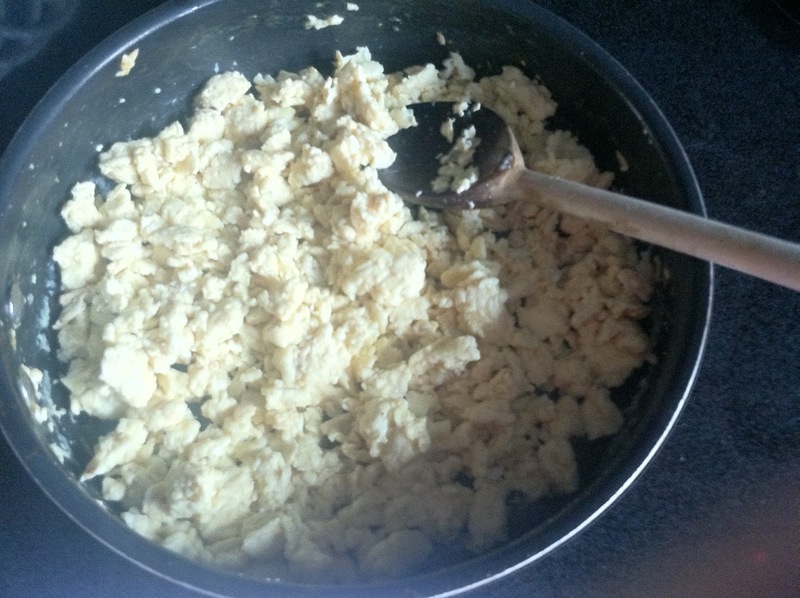 Scrambled eggs though – yummo! Once these are set, leave them in the pan but turn off the heat. 5. 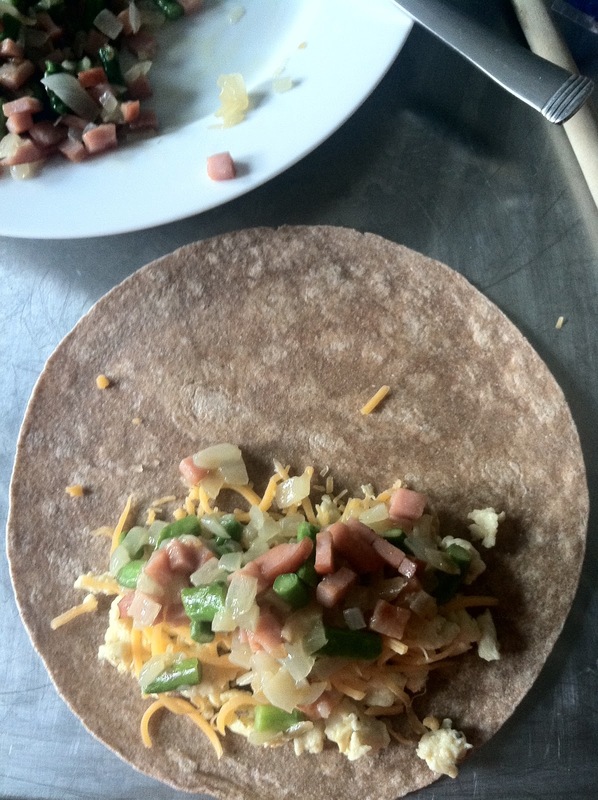 With your little assembly station ready (scrambled eggs, ham/onion/asparagus mixture, cheddar cheese, burritos), place one burrito on a flat surface, then add eggs, asparagus/ham/onions, and cheddar. I am pretty terrible at rolling burritos, so I can’t even tell you if this is where the ingredients are meant to be placed, or how to roll them well. I kind of just winged it, and they turned out fine, which means I’m sure you’ll be all set, too. 6. 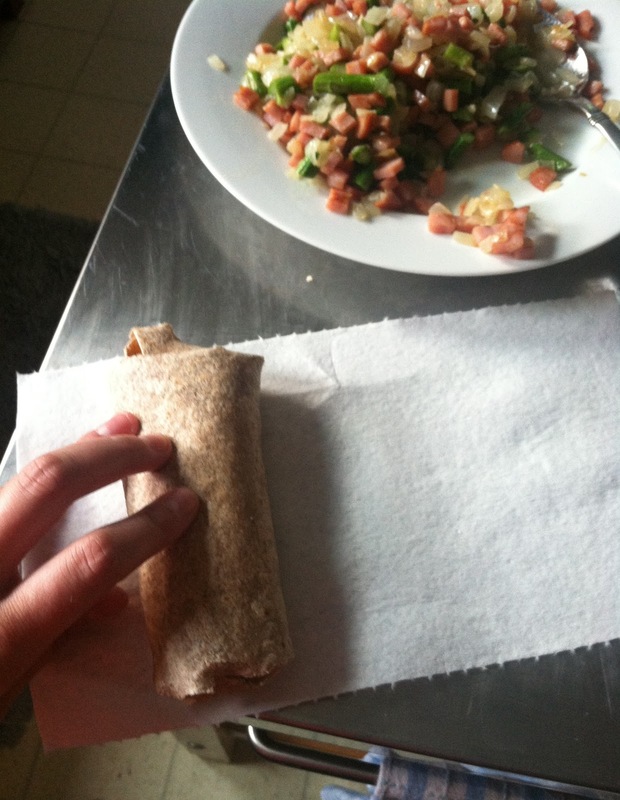 Once you’ve rolled your burrito, roll it up in a paper towel (this will help it not get soggy when you microwave it, I find that Viva “choose-a-size” is perfect for smaller burritos), and then wrap that tightly in a piece of aluminum foil. 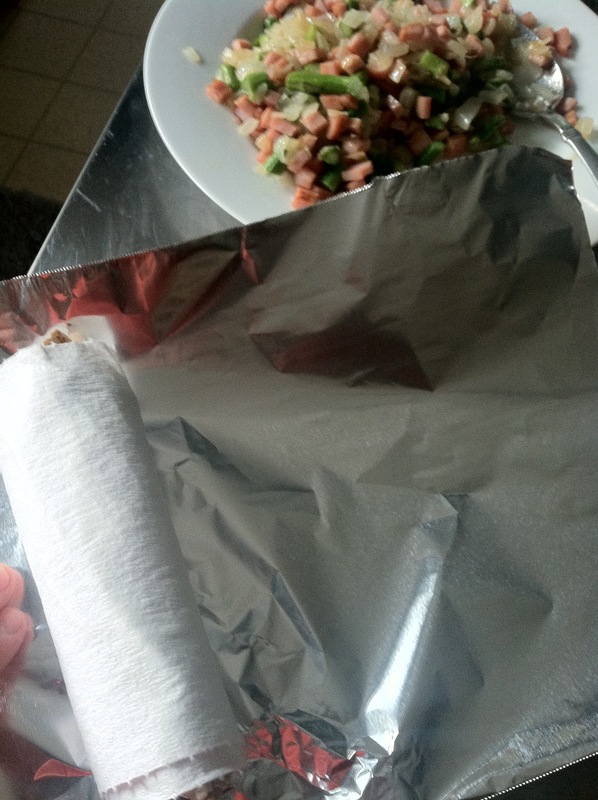 Put the assembled, paper-toweled, foil-wrapped burritos in a freezer ziplock bag. 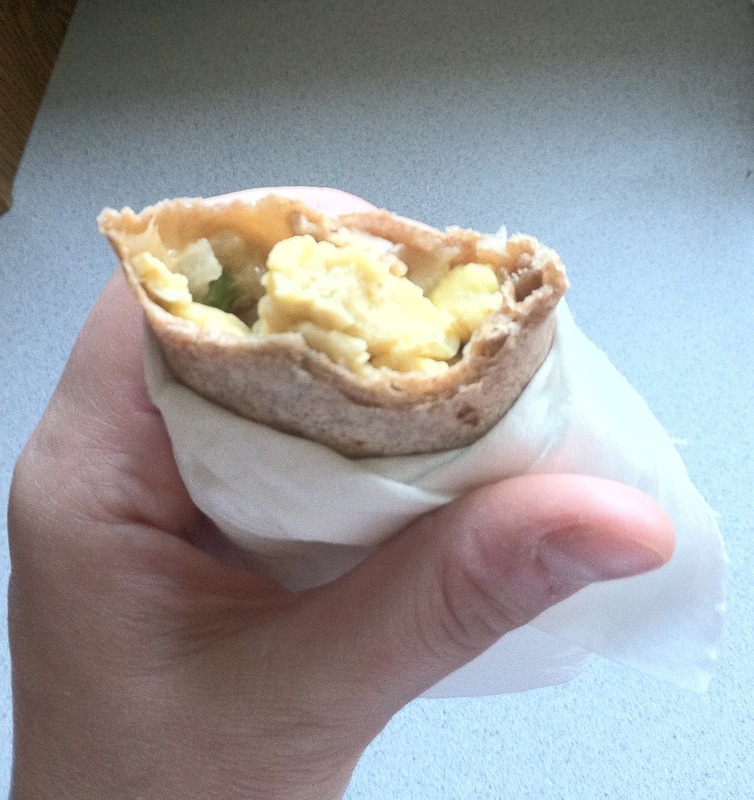 When ready for breakfast, remove one of the burritos, remove the foil (as I learned from watching my babysitter when I was 6 microwave a hamburger still in foil, microwave + aluminum foil = bad news bears), and heat for 1 minute on one side, flip to the other side, and microwave for 1 minute more. These are super tasty, and keep really well too. I thought that 1 burrito might be too little, but it ends up being a perfect breakfast portion for both me and Brad, which says enough! This entry was posted in asparagus, breakfast, burritos, cheddar, eggs, freezer, healthy, make-ahead, onions on September 10, 2012 by westyn.